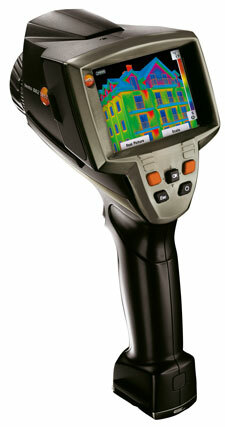 Testo 882 thermal imager with 320 x 240 pixels and < 60 mK. The thermal imager testo 882 in ergonomic pistol design, with 320 x 240 pixels, stands out thanks to even more precise infrared images. With 76,800 temperature measuring points, it sees every detail on the measured object. This makes it even easier for you to detect anomalies and weaknesses from greater distances. 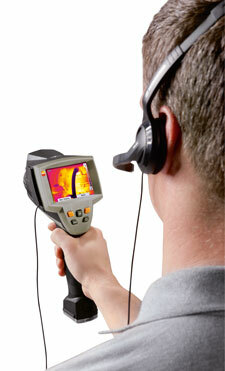 For you, that means: You see more and have more security when thermographing! 33 hz with USB video out - Create infrared videos for clients and marketing purposes. Infrared image sensor with 320 x 240 pixels - With 76,000 temperature measurement points, you detect measurement objects clearly and precisely. This ensures that noanomaly escapes you, even at greater distances. Large field of view thanks to 32 lens - With the 32 standard lens, you can work closer and see more detail at the same time. Very high image quality due to NETD < 60 mK - Thanks to a temperature resolution of < 60 mK, even the smallest temperature differences are visible with the testo 882. Voice recording withheadset - With the integrated voice recording, you can comment any infrared image directly during the application. This valuable information is stored together with the thermal image. 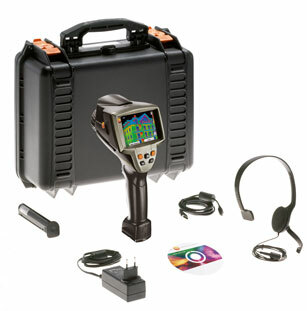 Built-in digital camera with power LEDs - In addition to the infrared recording, you store adigital photo image of the measurement site with the testo 882. The power LEDs guarantee you optimum illumination of dark areas when recording real images. Special measurement mode for detecting areas with danger of mold - By entering the ambient conditions, you can visualize areas in danger of mold growth in the thermal image at a glance. Isotherm display in instrument - The optical color alarm shows up critical temperature areas easily and directly in the thermal imagers display. Min/Max on Area calculation - The minimum and maximum values of an image section can be determined live directly on site and at a glance. Lens protection glass - The germanium lens protection glass protects the optics from dirt and scratching. Measuring range up to 1022F optionally possible, with the high temperature option. 5253 TruReward$ points will be placed in your account when you buy this item.